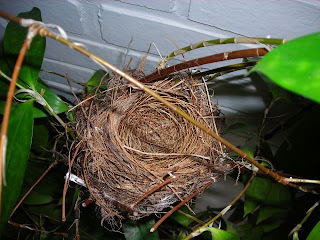 Ya, this beautiful nest shown is the empty one, left by the bulbuls, after the babies grew up last week. However, I noticed a bulbul flying out from the bamboo leaves again yesterday. Looking closing, I noticed that the male bird is building a new nest, just about 1.5 feet away from the old one. However, it is so close to our main door, and we may frighten them whenever we go in/out to our house. This morning, again I saw him working so hard. 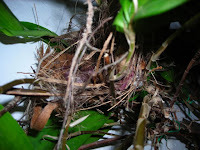 This second photo shows the semi-completed nest. 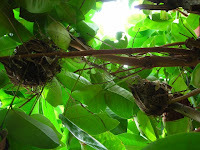 Just see how many nests are there within such a small angle of the jambu air tree. 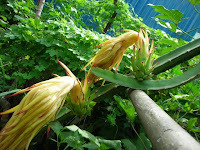 The Dragon fruit flowers withered, but the young fruits are beginning to form at the base. I have wrapped them up this morning to prevent fruit flies from attacking them. I trust they are available in US too. 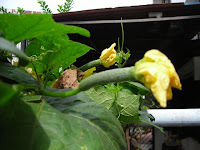 These are the baby loofahs, and the yellow flowers are bright and beautiful. 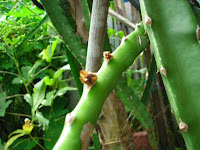 This one is approaching maturity. 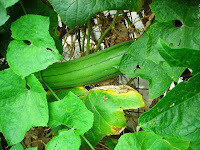 The longest we harvested is around 15". 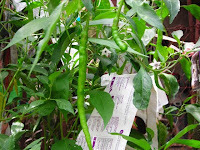 If ripen fully, it is used for washing.